Online Store | Paragon Resources, Inc.
Our highly effective MapMyStrengths.com Assessments can only be ordered by telephone. If you are interested in ordering the DISC and Workplace Motivators assessments that we use with all our relationships, please contact Amanda at 770.319.0310 or visit People Insights for more details. Our book and the companion toolkit can be ordered directly. Simply place your order using the form below. Know Service. Connect with Clients. Shape Your Future. Differentiate You! by Sarah E. Dale and Krista S. Sheets, published by Boundless Publishing. This 195 page “how-to” book reviews an easy-to-follow 5-step process and includes dozens of sample letters, scripts, checklists, and tools to help financial professionals attract and retain ideal clients and take their businesses to new heights. For more information read Making the Case for 5-Star Service by Krista Sheets and Sarah Dale. 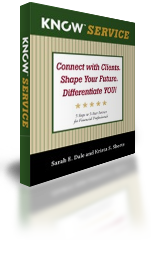 Our book, Know Service provides over 55 tools intended for financial professionals who want to increase their professionalism and take their business to new heights. The companion tool kit is a convenient electronic download designed to help you put these tools to work for your team. Replicate and extend your day into a week, month, etc.